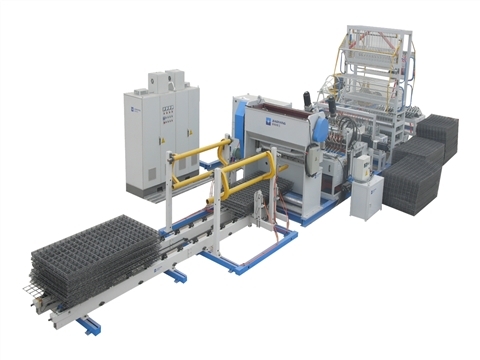 The concrete reinforcing wire mesh welding machine is suitable for large-scale steel mesh production. It uses 1-12 welding transformers to control the number of welding points to form N loops, and uses the principle of resistance welding to weld. Blanking system: The weft feeding adopts the new double hopper type to improve the machine production efficiency, and the stepping motor is used to control the feeding. The feeding is fine, the falling point is accurate, and the welding mesh welding machine has neat welding edges without secondary cutting side. The concrete reinforcing wire mesh welding machine adopts the synchronous control technology of the power electronic control system. The welding time, the sub-control welding time and the like are controlled by the digital integrated circuit, the control precision is high, the intelligence is more intelligent, and the precision is flexible. The concrete reinforcing wire mesh welding machine adds double molds on the original foundation of the hopper, which makes the manual feeding more time-saving, reduces the labor intensity, feeds into the bucket, multiple pulling wheels run at the same time, servo motor power drive, can meet the user model High speed continuous welding feed. The warp feed adopts the reeling of the coil wire, and no manual placement is required, and the servo motor controls the automatic feeding. Concrete reinforcing wire mesh welding machine manufacturers welcome your advice. The company is responsible for the installation and commissioning of the equipment and after-sales service, and assigns technical personnel to the site to install guidance and commissioning work, and conduct on-site training for the operation and maintenance of the equipment. After-sales service of the equipment: The equipment warranty period is one year, the equipment program part is lifetime maintenance, and the wearing parts and electronic parts are not covered by the warranty. In the event of equipment failure, our company will respond within one hour. After having time to go to the customer's site for maintenance warranty, our company provides lifetime after-sales service support and equipment parts at preferential prices.